each month in the “Bienvenue” and “Bienvenidos” tabs on the FPMT homepage! Lama Zopa Rinpoche during the long life puja offered on behalf of the FPMT organization after CPMT 2014, The Great Stupa of Universal Compassion, Bendigo, Australia, September 2014. Introducing Our New Foundational Program Coordinator! Enhance Your Practice of Generosity: Join the Merit Box Practitioners! Minutes of CPMT 2014 Ready for Use! Congratulations to LRZTP 6 Graduates! Lama Zopa Rinpoche enjoying the view from the Great Stupa of Universal Compassion, Bendigo, Australia, September 2014. 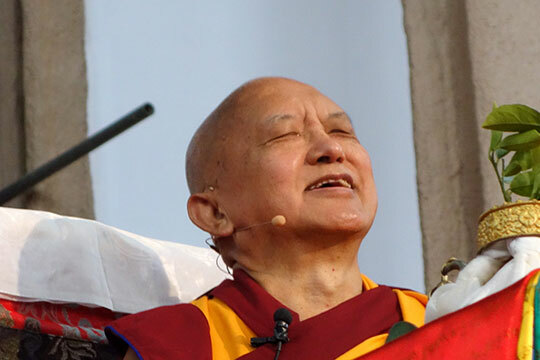 Live webcasts and recording of all the daily sessions with Lama Zopa Rinpoche at the retreat in Australia can be watched on the FPMT livestream webpage. Audio MP3 recordings of the retreat sessions with Rinpoche are available for download with translation into French, Italian and Spanish. Find a wide range of advice from Lama Zopa Rinpoche on Rinpoche’s Advice page. Go to the Lama Yeshe Wisdom Archive for lots more advice from Lama Zopa Rinpoche. Lama Zopa Rinpoche teaching during the retreat in the Great Stupa of Universal Compassion, Bendigo, Australia, September 2014.
online 24/7 on FPMT’s livestream webpage. The Words of Requesting and Offering to One’s Own Kind Root Guru (Garsha Drink Offering), composed by Kachen Yeshe Gyältsen and Lama Zopa Rinpoche, is now available as a downloadable PDF from the Foundation Store. This practice can be used when offering any drink such as chai, tea, coffee, juice, chang, etc. Venerable Joan Nicell has joined the Education Services team at FPMT International Office in the role of Foundational Program coordinator. In this new role, Ven. Joan will be overseeing the management and development of FPMT’s foundational programs such as Meditation 101, Discovering Buddhism, and Living in the Path. Please get in touch with Ven. Joan if you have any inquiries or comments about the FPMT Foundational Education Programs. 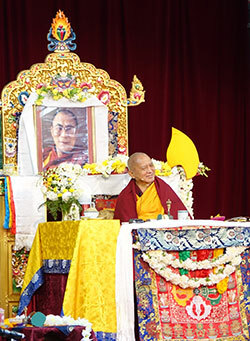 The Puja Fund arranges and sponsors pujas to be done when Lama Zopa Rinpoche is flying internationally, November 2013. In addition to an amazing array of ongoing pujas, practices and offerings dedicated for the entire organization, the FPMT Puja Fund provides many other services to the FPMT organization and our teachers, helping create peace for all. As an example, when Lama Zopa Rinpoche heard that one of his gurus, Choden Rinpoche, was manifesting some health obstacles, Rinpoche immediately sponsored a number of pujas through the Puja Fund. Pujas are also often arranged when Lama Zopa Rinpoche travels to remove any possible obstacles. Additionally, the Puja Fund recently made a donation to help Shantideva Study Group in Israel carry out Lama Zopa Rinpoche’s advice to help bring peace to Palestine and Israel and the whole world. Please rejoice in some of the incredible activities that the Puja Fund is able to offer on behalf of the entire FPMT organization. To keep up on all the activities of this beneficial project, please follow the Puja Fund news blog. Join the Merit Box Practitioners! Take advantage of our easy method for helping you practice generosity by turning your spare coins into grants for Dharma projects around the world! Order your FREE Merit Box piggy bank today and become a supporter of the 2015 International Merit Box Project grants. Support. Connect. Practice. Become a Friends of FPMT supporter today and join the international FPMT community in a new way! Learn more. We’re rejoicing in the fruitful efforts of all who organized and participated in CPMT 2014, which successfully concluded with the official annual long life puja offered to Lama Zopa Rinpoche on September 19. The minutes of the meeting, are now ready for your use! Read the wrap up of the meeting and enjoy Mandala’s coverage of the event. 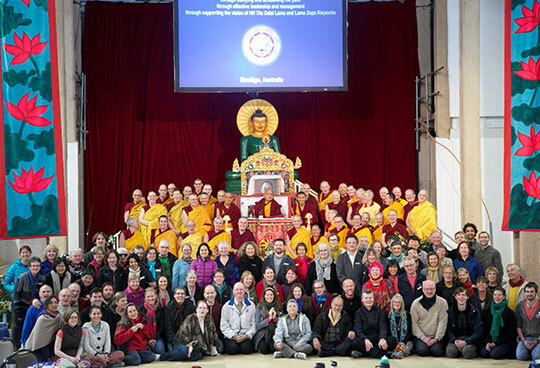 CPMT 2014 participants with Lama Zopa Rinpoche in the Great Stupa of Universal Compassion, Bendigo, Australia, September 2014. Get the Essential Buddhist Prayers Vol. I in print today and receive a 40% discount plus a PDF copy of the same title – suitable for your electronic device for FREE! Volume 1 of the three-part Esssential Buddhist Prayers series contains all the basic prayers and practices for daily practice with powerful mantras included at the request of Lama Zopa Rinpoche. The text features Tibetan phonetics combined with English translation in a line-by-line format, allowing the practitioner to chant in Tibetan and meditate on the meaning simultaneously. This promotion is valid only for FPMT centers, projects and services with a wholesale account. La traduction française du chapitre FPMT : Mission, intention et état d’esprit du Manuel de la FPMT est disponible. We warmly congratulate the students graduating this week from the two-year classroom portion of FPMT’s interpreter training program, Lotsawa Rinchen Zangpo Translator Program (LRZTP). We look forward to their bringing the Dharma to beings during the next phase of the program as trainee interpreters in FPMT centers! Chenrezig Institute, Australia is offering a wonderful opportunity to offer service as director; Tara Institute, Australia is looking for a new spiritual program coordinator (SPC); the Great Stupa of Universal Compassion, Australia, would like to host two Sangha members to help with visitors. Le Service de traduction francophone de la FPMT est à la recherche de traducteurs de langue maternelle française pour traduire à l’écrit de l’anglais vers le français, ayant une bonne connaissance du Dharma (particulièrement du lamrim) et, idéalement, étant familiarisé avec la manière d’enseigner de Lama Zopa Rinpoché. D’avantage d’informations.